A PLAN of the Parish of Christ Church shewing the present Sewers surrounding the same. 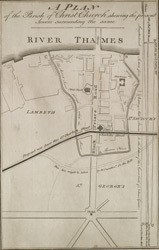 bl.uk > Online Gallery Home	> Online exhibitions	> Crace Collection of Maps of London	> A PLAN of the Parish of Christ Church shewing the present Sewers surrounding the same. This plan shows the existing sewage system and the proposals for a new sewage canal through Great Charlotte Street. A level section of the River Thames appears along the right margin, next to sewers in diagram. The title of the plan appears at the top margin.